The Cornish Pasty is now protected. BTW, who does this look like to you? When Americans like food, they eat it. When the Brits like food, they give it “protected status.” Yep, like an endangered species. 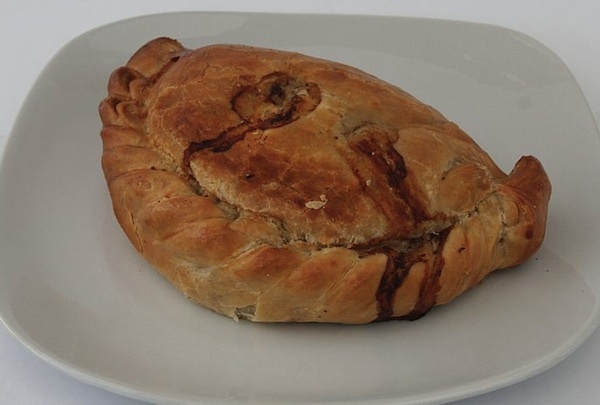 Last week, the Cornish pasty (think pie crust stuffed with filling and rolled up like a calzone and baked) joined other British delicacies like Jersey Royale potatoes and Cornish clotted cream and acquired “Protected Food Name Status” by the European Union (EU). Read more about it and view a map of the UK’s protected foods. Well, now the Cornish pasty will get the respect it deserves: If it’s not made in Cornwall, it can’t be called a Cornish pasty. Pasty, yes. Cornish, no. It makes me feel a little bit sorry for the food on our shores, so sweet and vulnerable. Posted on 3, August 2011, in Food and tagged British, Britrish, pasty, protected food. Bookmark the permalink. 1 Comment. Are you aware of Pasties from Michigan’s Upper Peninsula? They arrived there with Cornish miners and the Yoopay version contains more veggies than the British version, supposedly through corruption by Finns, though the Brit version is also sold under the now prohibited name CORNISH pasties. Fortunately the King’s writ runneth not in the Yoopay. If you really get hunger there are those on the web who will ship you UP Pasties. even the Cornish version.